One of the most important but underestimated factors impacting the operation of turbines (both steam and gas) and other machinery is the condition of the oil, especially its “mechanical” cleanliness (presence of solid particles). Although the need for appropriate oil care is commonly accepted among power plants with regular maintenance practices, the cleanliness of the oil system interiors (piping, tanks, coolers, etc.) remains an issue. 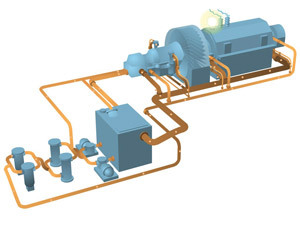 Problems caused by dirty oil systems in machinery such as turbo-generators, turbo-compressors, turbo-pumps and other large-scale oil systems (hydraulics, large stationary diesel engines, etc.) are quite common. The most reasonable and responsible maintenance strategy is to maintain the proper condition of the oil and oil system based on a correctly applied oil analysis program, determining not only basic oil parameters but also answering questions regarding the potential of varnish formation and other aging-related properties along with the general oil and component condition. Temporarily controlling the system’s interior is also advised (using endoscopy, visual inspection of friction nodes, control of used filter elements within their exchange process, etc.). Of course, the lubricant quality matters as well. 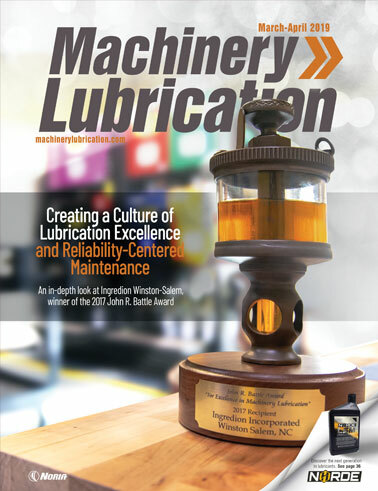 Unfortunately, from time to time, plants experience significant problems related to lubrication. A big part of these problems is associated with the purity of the oil. While many industry experts speak about the role of oil contamination, the issue of achieving purity of both the oil and oil system is often neglected or not discussed in detail. 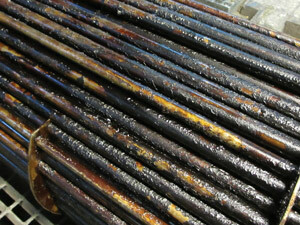 So what can you do when severe deposits, sludge, varnish or rust formation occurs in an oil system, or when a newly assembled oil system is corroded or contaminated with chemical preservatives or machining debris? 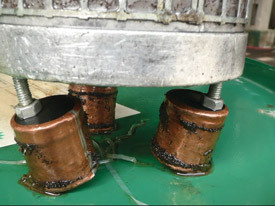 What can be done with large quantities of wear debris inside an oil system after severe seizure and breakdown of a bearing? 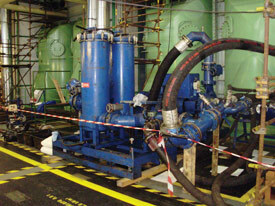 For trouble-free operation, contaminants must be removed from the oil system. However, in extreme cases, the level and type of impurities may exceed the separation capability of the system filters and threaten future equipment operation, resulting in loss of production. The standard maintenance approach then is not enough. Immediate cleaning of the entire interior of the oil system with subsequent turbulent flushing should be performed. Often, if the oil doesn’t meet specific requirements, oil replacement (exchange) is also required. Because proper cleaning of an oil system is not easy within an overhaul process or when assembling a new system, a variety of technologies and strategies have been used, such as mechanical cleaning with ramrods, chemical cleaning (with solvents, oil additives, etc. ), steam blowing or utilizing different oil flushing procedures. In dirty oil systems, most of these practices do not produce the desired results within a reasonable amount of time and money. Frequently, positive results do not last long but diminish, resulting in the need for additional cleaning. 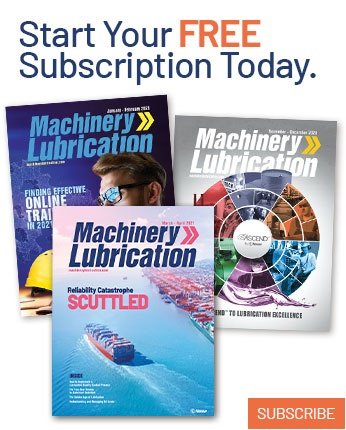 With the cost of operating dirty lubrication systems in turbines far too significant to neglect, more efficient solutions have been developed. One effective method of preparing new oil systems and restoring operated oil systems for future reliable operation involves the technology of hydrodynamic cleaning and flushing of oil systems. This alternative to obsolete or inefficient methods has become a preferred choice of many original equipment manufacturers (OEMs) and power-generation repair companies. One of the most expensive and underestimated problems associated with the use of machinery is the inadequate cleanliness of the oil system. It results in low oil cleanliness, thus leading to most maintenance problems and to related extra expenses (production outages, repairs, penalties and loss of customers). Impurities can enter the oil system during assembly, upon execution of overhauls or simply from the immediate surroundings. They also are created during operation due to oil degradation and corrosion processes. In process machinery, compressed gas often carries different impurities and can interact with the base oil or oil additives while entering the oil system through wet seal glands. These contaminants accumulate in the oil system interiors, creating different deposits. Impurities are the main cause of premature wear and can lead to equipment breakdown. The most vulnerable parts include bearings, hydraulic actuators and controllers, gearboxes, drive-shaft seals, pumps, oil coolers, filters and reservoirs. 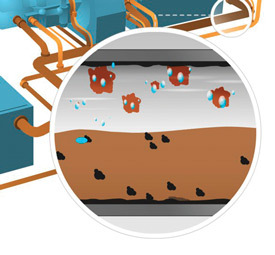 The most common impurities are metal debris from machining, welding slag, sealants or other materials used during assembly or repairs, oil system corrosion products (mainly rust), solid impurities, wear metal particles, and water from oil coolers or steam gland leaks and from ambient humidity. Impurities sometimes include gases (e.g., light hydrocarbons or ammonia) and cooling liquids. Other troublesome impurities involve oil degradation products from aging and thermal stress, which create insoluble chemical compounds that are responsible for varnish and sludge formation. Impurities also lead to increased consumption of filter cartridges. During operation, these impurities are carried by oil to lubricated components, depositing on the inner walls of pipelines, coolers, tanks and other elements. The presence of water accelerates the creation of corrosion inside the system. The current trend is to build oil systems from stainless steel. However, some parts that can corrode rapidly (armature, tanks, etc.) may still be made of carbon steel. In older systems, which are made mostly of carbon steel, the problem of corrosion is significant. These systems are prone to corrode quickly, especially in parts that are not permanently filled with oil (gravity return lines, tank roofs, etc. ), due to water condensation on these surfaces. With oil such a key component of any mechanical device, problems related to the lubricant often turn into problems with the machinery. In most cases, impurities in the oil mean interruptions in machinery operation. Particles in the oil that can be damaging to lubricated components may be very different in size, depending on the cleanliness requirements given by the component manufacturer. However, the dangerous size normally is smaller than the human eye can see (less than 40 microns). In practice, a machine consists of many components (e.g., bearings, sealing glands, hydraulics, etc. ), so the purity of the oil and the system should meet the requirements of the most demanding component. In a typical turbine system, hydraulics require the highest oil cleanliness and the smallest average size of dangerous particles. Most available standards, recommendations and industry practices place a lot of attention on the flushing process before startup of the system. While turbulent flushing of dangerous-sized contaminants will prepare an oil system for safe operation, only a well-designed flushing procedure will be effective. In many cases, even the most turbulent flows will not remove well-attached/sticky deposits from the system walls. 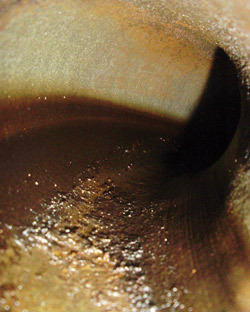 When flushing a system in which such deposits are present, reaching the required oil cleanliness can be difficult. Indeed, achieving reasonable oil cleanliness can take a long time. In addition, during initial startup and regular operation of a turbine when conditions are quite different than when flushing (system vibrations from machinery, high temperatures, different flow velocities, shocks from pump starts, valves opening, etc. 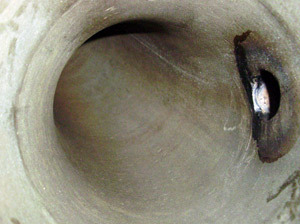 ), it is common for new particles to detach from remaining (after flushing) dirt from the system walls. Diminishing oil cleanliness is then usually observed. This type of situation is most often visible when severe deposits are present in the system, especially varnish, sludge and rust. Some of the mentioned impurities cannot be cleaned by means of turbulent flushing only. Prior to flushing, thorough cleaning of the system should be performed. Cleaning an oil system is not an easy process. Many irregular and rough surfaces made of metal, narrow spaces, recesses between flanges, etc., demand lots of effort and expertise to detach any deposits in order to remove them from the system with turbulent flushing. Hydrodynamic cleaning with high-pressure water jets and subsequent high-velocity oil flushing of systems offers a viable alternative to other frequently insufficient and obsolete methods. This cleaning and flushing technology can be an effective method of preparing new oil systems and restoring operated systems regardless of their size and complexity. 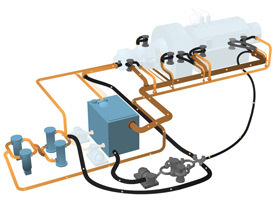 The technology includes three phases: hydrodynamic cleaning using water at very high pressure, flushing of the system with oil at high (turbulent) flow rates and with full-flow absolute filtration, and post-assembly bypass oil filtration prior to equipment startup. 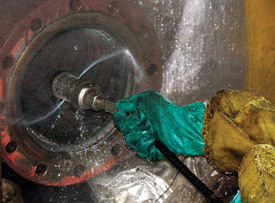 The core of this technology involves cleaning all the inner surfaces of the oil system with high-pressure water jets utilizing suitable nozzles, immediate drying and application of a protective turbine oil spray to the dried surfaces, followed by flushing with continuously filtered oil at sufficient pressure and flow rates. High-pressure water hydroblasting of all the interiors of pipelines and other elements of the oil system (coolers, reservoirs, bearing stands, etc.) using suitable equipment (elastic lances, nozzles, water guns, etc.). Immediate drying of cleaned surfaces using filtered, compressed air. 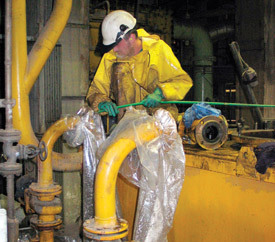 Application of anti-corrosive protection on dried surfaces (spraying with lubricating turbine oil) until flushing occurs. Protection of open flanges from environmental dust and dirt until the flushing process takes place. This advanced technology allows disassembly of only necessary small parts of the oil system (pumps, valves, fittings, coolers, etc.). The goal of hydroblasting is to ensure all of the system’s interiors are free of corrosion, sludge, varnish and other deposits. The pressurized water mechanically removes/detaches such deposits from the inner surfaces of the oil system and carries them outside the system by means of a water stream. The water used for cleaning is sweet, potable water or decarbonized water from the power plant, so the risk of system contamination by any chemicals is eliminated. Future flushing is then possible by oil that will be further operated in the turbine. Immediate drying of the cleaned surfaces using filtered, compressed air and applying a protective layer of turbine oil (spray) prevent against secondary corrosion of the cleaned oil system. The system remains completely dry after the hydrodynamic cleaning phase, thus eliminating the risk of water ingression into the oil during flushing. During this step, all impurities that remain in the system after hydroblasting are removed while ensuring the appropriate purity of the oil in the system. The system is flushed using special filtration and pumping units with turbulent flows at rates ranging from 13,000 to 20,000 liters per minute. These units have appropriate operating parameters and are connected to the oil system with hoses, manifolds, bearings, servo-motors and other flow-restricting elements. Flushing is performed using fresh turbine oil, which will remain in the system for further use. A separate batch of flushing oil is not needed. The flushing process continues until the predetermined purity criteria are reached in each location of the system. During this time, the oil temperature and direction of its flow are changed in order to move out remaining impurities. Flow rates at all pipeline sections should be sufficient to invoke turbulence. The oil cleanliness class measured in various locations of the system should be better than required by the turbine manufacturer (e.g., 17/15/13 according to ISO 4406). The oil’s purity is measured during the flushing process using appropriate instruments and according to a predetermined schedule. Cleanliness requirements can also be set higher upon request. No solid particles greater than 150 microns are deposited on the 100-micron mesh strainers installed in strategic locations throughout the system. Smaller particle sizes may also be warranted. Depending on the customer’s requirements, the oil purity criteria can be more stringent. However, in most cases, the typical result is much better than a cleanliness class of 14/13/10. The technology of hydrodynamic cleaning and flushing with oil at turbulent flow rates provides a highly effective method for the renewal of dirty and corroded systems to “like new” condition while also being suitable for newly assembled oil systems. Hydroblasting not only disinfects the system from aging products, old oil, protective layers or other chemicals that might contaminate fresh oil, but also shortens the future flushing process because most impurities are removed by water. The small amount of contaminants that remain in the system are then easy to flush out. In addition, hydroblasting is quite useful before an oil exchange and permits deep investigation of the oil system by endoscope prior to flushing. Flushing after hydroblasting is fast and efficient, allowing a completion date to be set and a schedule to be maintained with no extra time needed for prolonged flushing. With this technology, proactive maintenance based on oil analysis can be implemented. The method is entirely safe for the natural environment, as pure water is the cleaning medium, and the wastewater contains only impurities detached from the inner system surfaces along with trace quantities of oil washed from the system. Long-term warranties in regards to the system cleanliness are also a possibility.